Every year thousands of Sahrawi children from the Tindouf refugee camps in the Algerian desert come to Europe for a two-month summer holiday - which doubles as a diplomatic mission. Temperatures in the desert can get up to a blistering 50°C during the summer months, and it was for humanitarian reasons that the Sahrawi government-in-exile (and the aid agencies supporting it) first decided to organize trips to Europe for the camps’ children. These trips soon became part of a campaign to attract international attention to the cause of the Sahrawi people, the majority of whom have been confined to refugee camps in Algeria since 1975 when their homeland, the Western Sahara, was ceded to Morocco and Mauritania by departing colonial power, Spain. The Sahrawi struggle for independence dates back as far as 1884 when Spain was assigned the Western Sahara in the European carve-up of Africa at the Berlin Conference. Raids, rebellions and simmering unrest made the Western Sahara a difficult proposition for the colonizing power, which was further plagued by Morocco’s persistent claims on the territory. 1967 saw a peaceful uprising of Sahrawi nationalists – the Harakat Tahir – subsequently brutally repressed by the Spanish, triggering a militarization of the conflict and the creation of the Polisario Front in 1973, which called for armed revolution against Spanish rule. The Front, under the leadership of El-Ouali, became a force to be reckoned with, gaining control of the countryside and pushing the faltering Madrid government into negotiations for the handing over of power. However other players in the area had different ideas. Neighbouring nations Morocco and Mauritania both claimed to have historic rights over the territory. Despite a verdict handed down by the International Court of Justice which declared the nomadic Sahrawi true owners of the land with a right to self-determination, the Madrid Accords of November 1975 divided the Western Sahara between Morocco and Mauritania, with Spain awarded some fishing and phosphate mining rights. The majority of Sahrawis fled to the desert of south-western Algeria and became refugees, while a minority stayed on as second-class citizens in the towns occupied by Morocco. 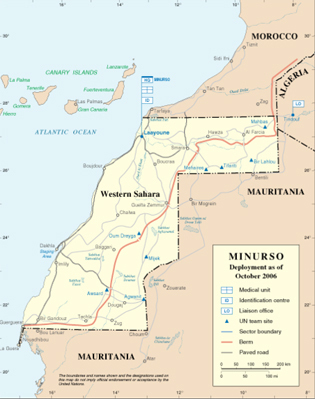 In response to Spain’s ceremonial transfer of administrative power to the Moroccans in February 1976, the Polisario Front immediately proclaimed the Sahrawi Arab Democratic Republic (SADR) as a government-in-exile and the newly-formed Sahrawi People’s Liberation Army turned their attentions to the latest invaders. A 16-year-long struggle ensued, with an early Polisario victory over the weak Mauritanian government forces neutralized by Morocco’s prompt annexation of the vacated territory. The building of a massive desert sand berm – the so-called “Moroccan Wall” – during the 1980s effectively drove the war to a stalemate. Dividing the Western Sahara into Morocco’s “Southern Provinces” and the Polisario’s (mostly uninhabited) Free Zone, the Wall is heavily fortified with landmines, bunkers, radar surveillance and military patrols all the way along its 2,500 kilometre length. Monitoring the Wall became a financial burden for the government in Tangiers and in 1991 the Polisario Front and Morocco signed a UN-brokered ceasefire. The Settlement Plan included the promise of a referendum to be held among the Sahrawi population to choose independence or unification with Morocco. This referendum has yet to be held and a second UN peace proposal – James Baker’s 2003 Peace Plan – has failed to make any headway, with Morocco showing little interest in modifying the status quo. The UN Mission for the Referendum in Western Sahara (MINURSO) was set up in 1991 to oversee the transitional period for the preparation of the referendum. Currently their main task is to monitor the ceasefire. The MINURSO budget for 2010-2011 is US$60 million. There are four main refugee camps – vast tent cities – set in the desert around Tindouf in south- western Algeria, an inhospitable stretch of land with no vegetation or water, frequent sandstorms and extreme temperatures both in summer and winter. 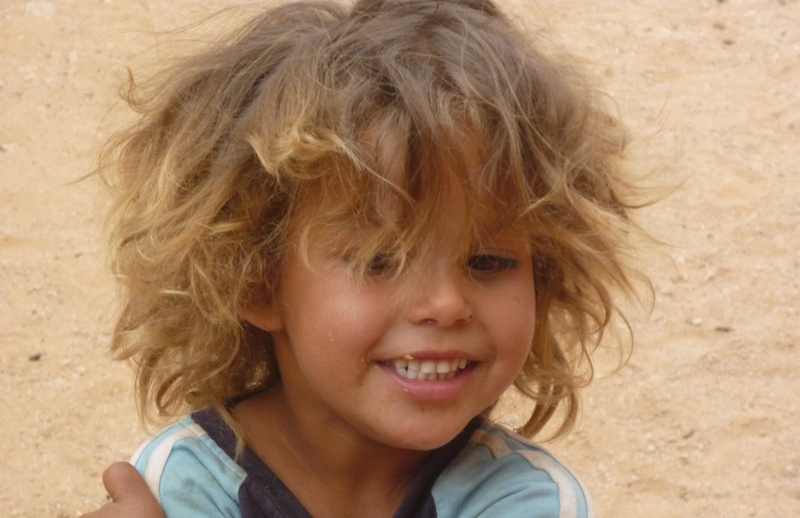 The Sahrawi exiles in the camps are entirely dependent for survival on international aid organizations like the Red Crescent, WFP and UNHCR as well as on host country Algeria. 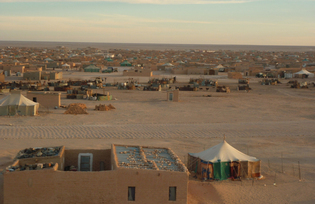 Home to a population of between 150,000-200,000, the camps are named after cities in pre-colonial Western Sahara: El Aaiun, Awserd, Smara and Dakhla, and run entirely by the SADR government-in-exile: one of the only cases of refugee camp self-management in the world. The SADR government organizes the running of their schools, hospitals, administration and distribution of aid packages. Water is delivered by water trucks and electricity is provided by car batteries or mini-solar panels set up outside each tent. Families often build a mud-brick annex to their tents (which are distributed new every five years by the UN) as protection from the recurrent sandstorms and the burning heat of the day. The tents are cooler to sleep in at night. Firewood has to be collected by car from several miles away. Food is simple and basic: pasta, cous-cous, potatoes, beans and lentils and very occasionally meat or fruit and vegetables. The limited diet can have repercussions on the refugees’ health: celiac disease is common (around one in every 17), and many suffer from eye and skin problems (due also to the extreme climate). Television is a rarity and children make their own fun, with the dunes as their playground. 99% of the camps’ children attend primary schools run by teachers who have been trained at vocational courses on site or at colleges and universities abroad. Those who wish to pursue their studies go overseas (especially to Spain and Cuba) or to further education in Algeria, as part of aid packages. Education was made a priority by the SADR right from the beginning and there is now 95% literacy among the camps’ population – compared to 10% in 1975. Most Sahrawis have no work and for many the days are all the same. Time is whiled away by the elaborate ritual of the traditional tea brewing and drinking ceremony where green tea is prepared in three different strengths – bitter as life, smooth as death and sweet as love. However some Sahrawis do have jobs, working in the schools or the hospitals or the camp administration and a few have started up micro-businesses like food markets and small transport firms. Events like the arrival of a European delegation provide many with the opportunity to get involved and contribute to welcoming and caring for the guests. Camp life is nevertheless particularly trying for adolescents, who have no distractions or recreation to fill their time. 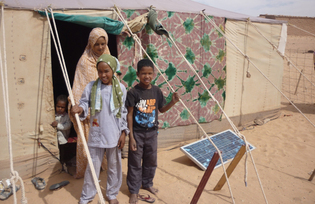 Aid projects are consequently becoming more inventive as awareness of the Sahrawi’s situation grows. The FiSahara film festival, now in its seventh year at the Dakhla camp, attracts several hundred actors, directors and producers from Europe every May. The festival holds workshops and seminars for the refugees, as well as offering them the rare treat of film screenings. This year saw the inauguration of a fully-equipped radio, film and television school in the Dakhla camp – giving the Sahrawis themselves a chance tell their own story to the world. Until they travel to Europe for their summer holidays, children from the camps would have never seen the sea, or a lake or river, nor parks and forests – they only know of these things through the stories told them by the Sahrawi elders. Spanish NGOs and associations do the lion’s share of hosting the young refugees with the “Vacations in Peace” programme bringing between 7,000-10,000 children to Spain each year. Italy’s contribution is more modest, with around 350 primary school-age children spending two months with local families and volunteer associations as part of the “Sahrawi Children Peace Ambassadors” project. Volunteer carers and parents involved are given special training to prepare them for their young charges, who arrive in small groups accompanied by one or two adults from their own camp. The holidays are spent at the beach, or in the countryside, with parties and events to make every day memorable. However time is also dedicated to the Sahrawi cause, with meetings with local authorities, community organizations and where possible the press. The SADR has been a full member of the African Union since 1984 and is currently recognized as the legitimate government of the Western Sahara by 81 countries, mostly African and other nations in the developing world. Despite the annual invasion by the Sahrawi children, no European nation yet recognizes their government. However the many volunteer associations and activists worldwide are convinced that the day will come when the Sahrawi children will have their holidays in their own land, and be able to swim in their own sea. Luciano Balducci is the co-ordinator of the Equipe Nazionale dell’Accoglienza dei Bambini Sahrawi in Italy, organizing the nationwide summer programme for the Sahrawi children. He is the head of the Sahara Libre dell’ Borgo Ragazzi Don Bosco in Rome, one of 50 associations spread over 12 regions of Italy which host and raise funds for the Sahrawi children.